Leaves have turned from green to gold. Snow has fallen. Halloween, always a favorite in this home, lurks right around the bend. And while my husband, our little boy and I are dutifully planning homemade costumes, carefully gathering materials for ghoulish crafts and decorations for the home, the though of how to celebrate the festivity of Halloween without (too much) emphasis on sugary treats and purchased plastic decor. That’s not to say we don’t celebrate Halloween with treats and through trick-or-treating. I’m never one to take a draconian approach to food; rather, I emphasize homemade, real food treats where I can. 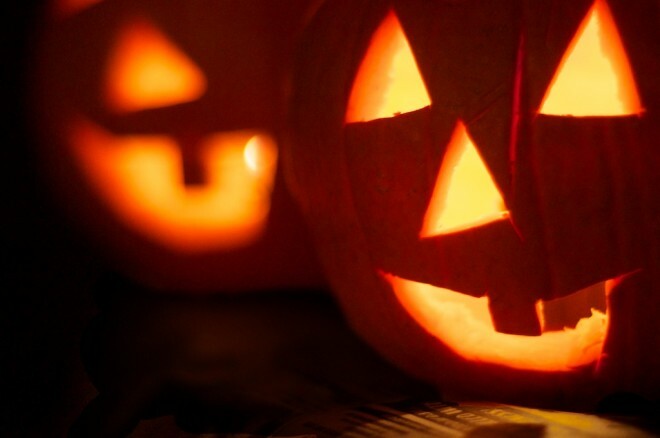 Halloween, like most festive, seasonal celebrations, is about principle without denial, and providing a joyful holiday for my little boy and his friends. So here’s my favorite ethically sourced candies (and where to get them) as well as some real food treats for Halloween you can make with your children at home. 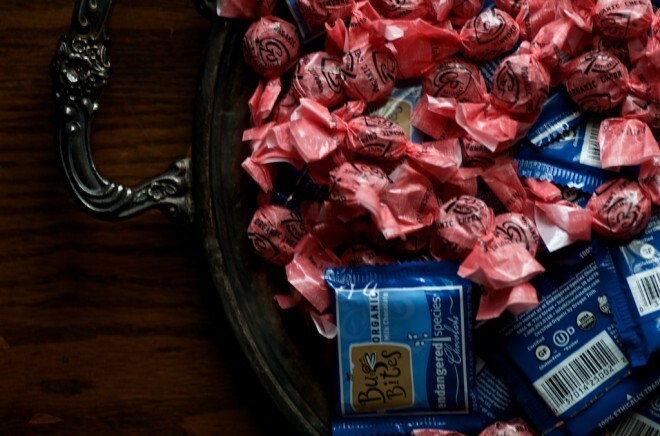 This year, I purchased Bug Bites (little bits of fair-trade, non-gmo chocolate) as well as Go Naturally organic blood orange and cherry hard candies. I also picked up some American-made, brain-shaped strawberry lollipops (my little boy will go nuts for them!). We ordered our candy in bulk online here. We also plan to donate candy to this project so children who do not have the means we have can still enjoy some better choices this Halloween. I celebrate the seasons from my kitchen, taking in the bounty that each season offers up, and transforming it into something distinct and memorable for my little boy. October brings apples, in abundance. 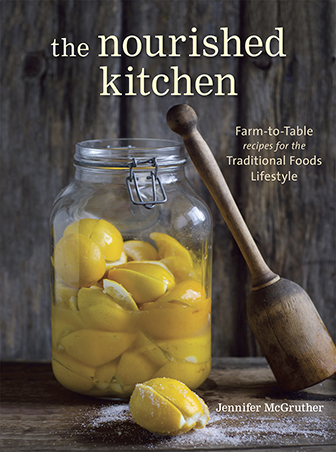 We eat them with breakfast, with lunch, as a snack, tucked into savory and sweet dishes. 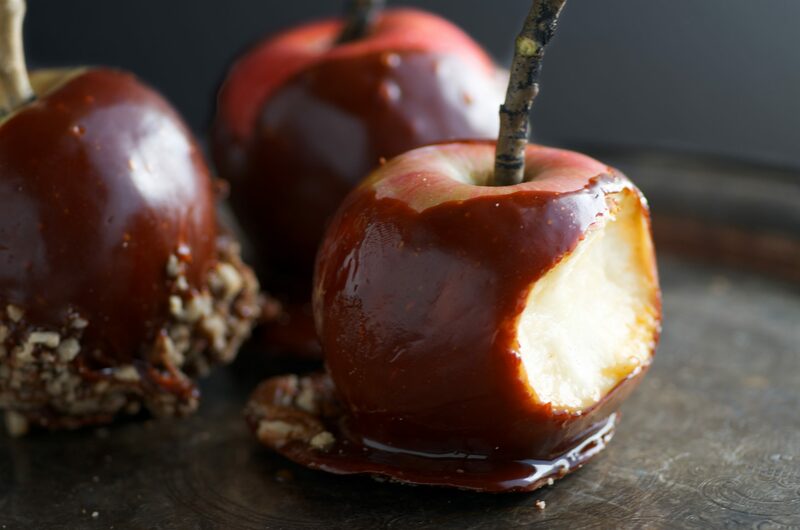 One of my favorite ways to turn the abundance of apples into something special is to make Spooky Honey Caramel Apples. We save these Honey Caramel Apples for ourselves, and for our close friends as few people will accept prepared food from a stranger on Halloween night. 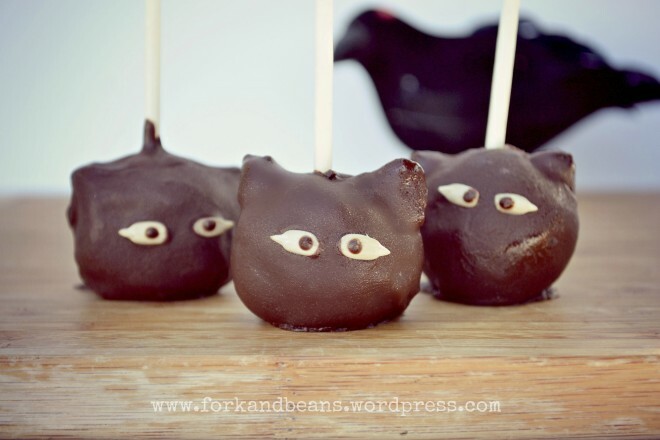 This year, I’m also planning to whip up some of these Black Cat Cake Pops from Fork and Beans. Aren’t they darling? They look super cute and like a lot of fun to make. The recipe includes nuts, dates, vanilla, coconut oil and maple syrup. So impossibly easy, and a pretty good option for a simple real food treat for Halloween. Get the recipe here. In mid-October, when we drive to our local farm to pick up our weekly CSA (an impressive array of fruits, vegetables, culinary and medicinal herbs), we take the time to stop by a local pumpkin patch and corn maze. I pack thermoses full of hot apple cider or warm milk with molasses and nutmeg, and we work our way through the maze feigning to be lost. Later we pick out our pumpkins. My son always chooses one that’s far too big and too heavy for him, but he manages to get it in the car. 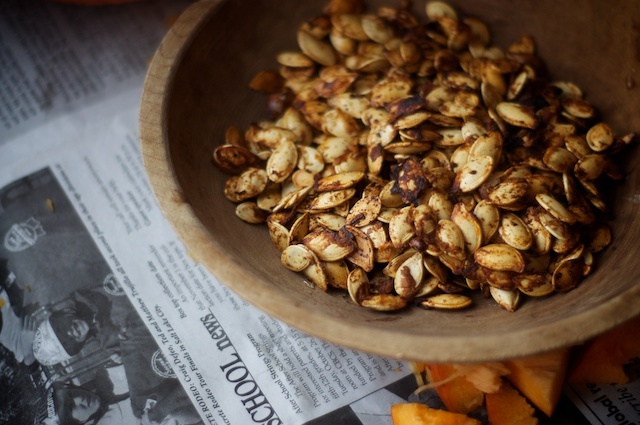 Later we carve them, set them out on the stoop and roast their seeds. I like to coat them with chili, salt and lime. Here’s the recipe. Another treat I can’t wait to try this Halloween are these Grain-free Chocolate Spiderweb Cupcakes. 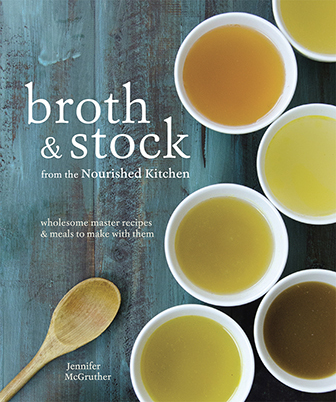 While we are not a grain-free family (or even close! ), I do value grain-free sweets and treats simply because I find them more satisfying overall than those made with regular flours. The complement of fats and proteins found in grain-based flours is a nice balance for the sweeteners in the desserts and cupcakes, bringing greater balance overall to the dessert. Get the recipe for these Spiderweb Cupcakes from Texan Erin here. Thank you for this article! Great resource info! As a parent who is trying to do right by my children, I came to realize how hard it was to find them a better alternative, I have tried to make our own on occasions, but it’s time consuming. Love it! I have no qualms about throwing junk food away. You go, girl! Happy Hallows! Also as a mother “trying to do right by my children” I let them trick or treat on Halloween…and THEN we come home, sort and count all the candy and then I let them eat it all…either in one night or piece by piece- it is up to them. My husband and I are both endurance athletes and I qualified and will be running the Boston Marathon in April next year. Our bodies are important to us and we like to take care of them. We eat healthy whole foods in our house. I make most things completely from scratch. We have balanced meals and realized that food is fuel, food is important and we need to put good things in our bodies. This is the norm in our house. On occasion I will buy candy for my kids, but it is not something I have in my house on a regular basis. Same with processed junk foods and fast food. It is not a regular thing…but it is not a “never” thing either. When my kids eat too much candy they realize what it does to their bodies and that they don’t want them to do it again- same with processed foods and anything that is not good for them. In fact, we realize eating a whole bag of organic trail mix in one weekend is not a good idea either. That being said. I do explain to my kids why we don’t eat certain foods on a regular basis, I do not completely demonize them and I let them have a fun day in October each year where they can go hog wild and learn what is good for them and what is bad. Moderation in all things. Ahh! i almost forgot I make roasted pumpkin seeds and that my son loves them to death!! Thanks for that little reminder. I have a hard enough time getting him to eat healthy treats. Thanks so much for including my cupcakes! Oh, Black cats for Halloween! And spiderweb cupcakes! Absolutely scrumptious. But I’d really like to see the brain lollipop too!